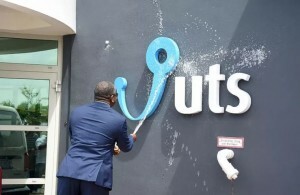 WILLEMSTAD - The local telecommunication company United Telecommunication Services (UTS) will stop with its services to betting providers. This is according to the company in a press release. It became clear that UTS is not abiding by the law. The negative reports are so harmful to the telecommunication company at home and abroad and that is the reason why UTS is taking a critical look at its own role in all this. It’s still fresh in everyone’s mind that the political leader spoke about the questionable role of UTS in the gambling sector just before his death in May 2013.